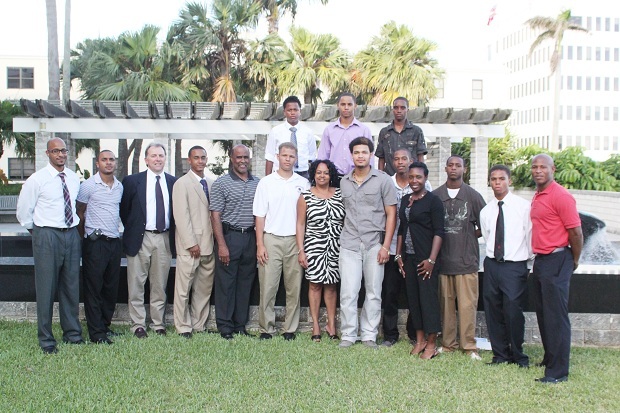 The PHC Foundation held its fourth annual scholarship awards presentation on Monday July 25, 2011 at XL House. In total, $39,800 was awarded to ten young men to assist in their studies at prep school, Bermuda College and university. Over the last three years, the PHC Foundation has given over $100,000 to young people at PHC to assist in their education. Guest speaker for the event was CEO of Catlin (Bermuda) Graham Pewter who encouraged the award winners to master their discipline by putting in 10,000 hours of work into their goals and dreams. He also noted the positive contribution of international business to Bermuda’s economy and encouraged the young people in Bermuda to take part in it. The awards presentation was also attended by the President of the BFA Larry Mussenden who said that the PHC Foundation is a model for the BFA and other clubs in Bermuda. Sophomore KC Castle was grateful for the role that football has played in assisting him to pursue his BA in Finance at the University of Indianapolis. He mentioned that football has taught him determination and discipline which is what one needs to accomplish their goals. The PHC Foundation was founded in 2005 and its primary objective is to assist young people at the club to pursue higher education. For more information, visit the PHC website at PHC.bm or their Facebook page. Congrats and continued success !!!! Good stuff! It’s always good to hear positive news. All the best to the recipients! Thanks Bernews for once again bringing news and progress to out attention. Great to see young men doing the right thing and making a fotting in their future….stay to the wicket…….the goal posts are not far away………. Congragulations to the recipients as well as the PHC Foundation. Very encouraging news.Wish them all the best in their endeavours.Next step up from prep school is college. Congratulations to PHC and the PHC Foundation!